I met Osama Jalali, the famous food critic, a few days back in the alleys of Chitli Qabar, where he shared about the Shahjahanabad ki Sair Food Festival at Ssence, The Suryaa Hotel, from the 19th of December to the 21st of December. 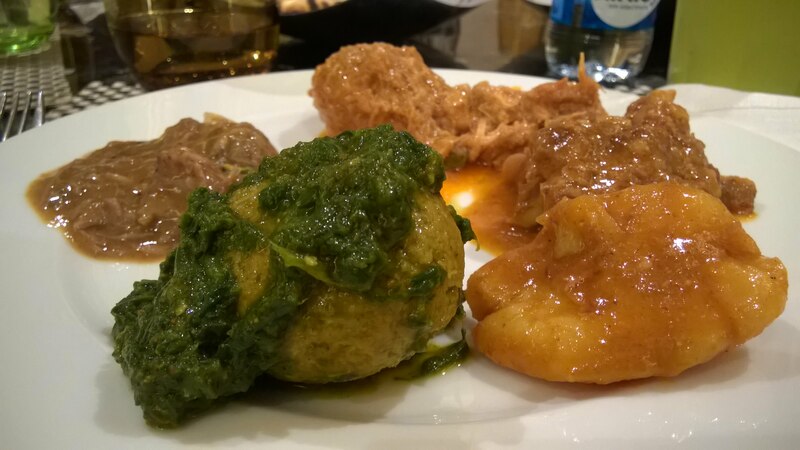 There are many reasons to go to Shahjahanabad ki Sair at Suryaa Hotel, the first being that the food is cooked by Nazish Jalali, mother of Osama Jalali, who hails from Rampur and knows all the ins and outs of Rampur and Old Delhi cuisines. Secondly, Osama Jalali, who himself was born in Old Delhi, has curated the food festival. Thirdly, the spices and ingredients have been picked straight from Old Delhi; fourthly, to interact with Nazish Jalali and Osama Jalali, to understand the food preparations; fifthly, the food is served in copper utensils, which has its own charm of the old city. Sixthly, not much oil and ghee has been used in the cooking, keeping in mind the clientele of the hotel. Seventhly, the sair (literally, the journey, of Old Delhi food) can be enjoyed at one place in the cold winter of Delhi. Lastly, the best food cooked in the world is always by mothers in the home kitchen and has to be exceptionally good. 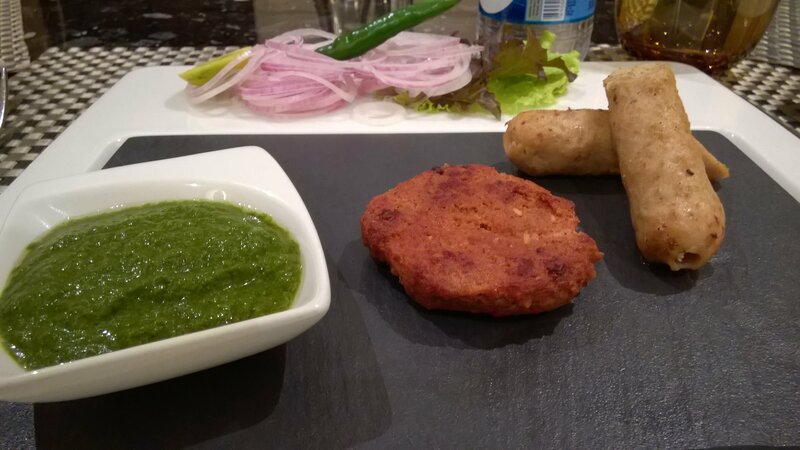 The sair at Shahjahanabad started with chicken seekh kebab and kache keeme ke kebab. In the main course, I was served aloo gosht, chicken korma, saag kofta, mutton nahari, hari mirch ka keema, and mutton biryani. All of them were excellent in taste, especially hari mirch ka keema, which has a nice flavour of green chillis but can be handled easily even if one does not like the spicy food preparations. The mutton biryani is cooked in the dum style and served with red chillis chutney. Most of the biryani sellers in Old Delhi use a special kind of rice called “sella” (par boiled) rice. I have seen the most famous biryani seller in Haveli Azam Khan draining out the excess water from the rice on a piece of cloth. That shows the rice will always retain its shape even if it is over cooked and water can be added if it is undercooked. The art of cooking biryani is in basmati rice, neither overcooked nor undercooked. 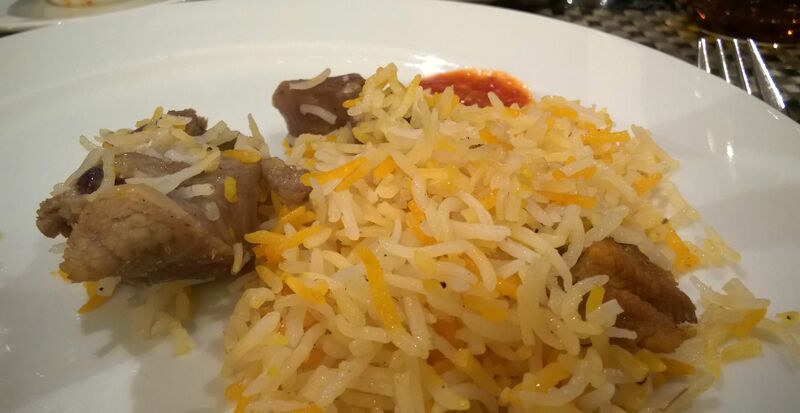 Nazish has done justice to the biryani by retaining the shape, texture, flavours of the spices and tenderness of the meat. 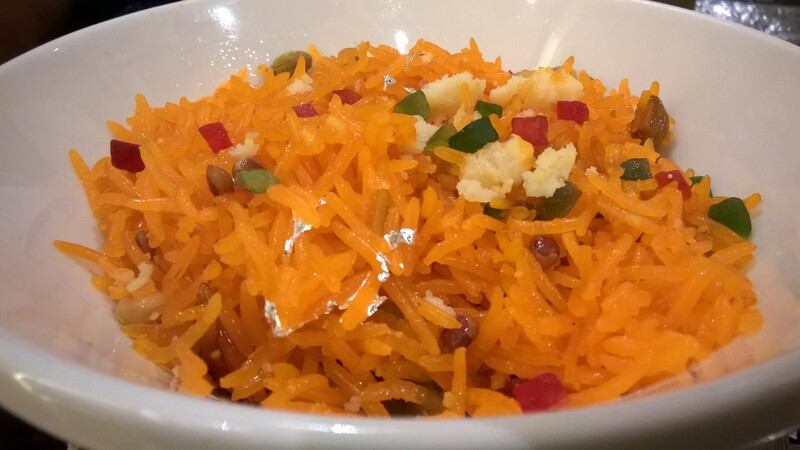 I rounded off my meal with Zarda, sweet flavourful rice with khoya, raisins, cashews, cherries and ghee. Throughout the sair, I never felt like I was sitting in a fine dining, high end place, as the interaction with Osama Jalali about the bawarchis, khansamas, and the food revolved around Shahjahanabad. The menu works on a rotational basis with different kebabs and curries every day. So, if you want to get the feel of the home cooked style food of Shahjahanabad, visit Suryaa hotel before the 21st of December between 8 p.m. to 11 p.m. The price per person is Rs. 1950 for the entire buffet.